Betfair have a variety of offers available to both new & existing customers. 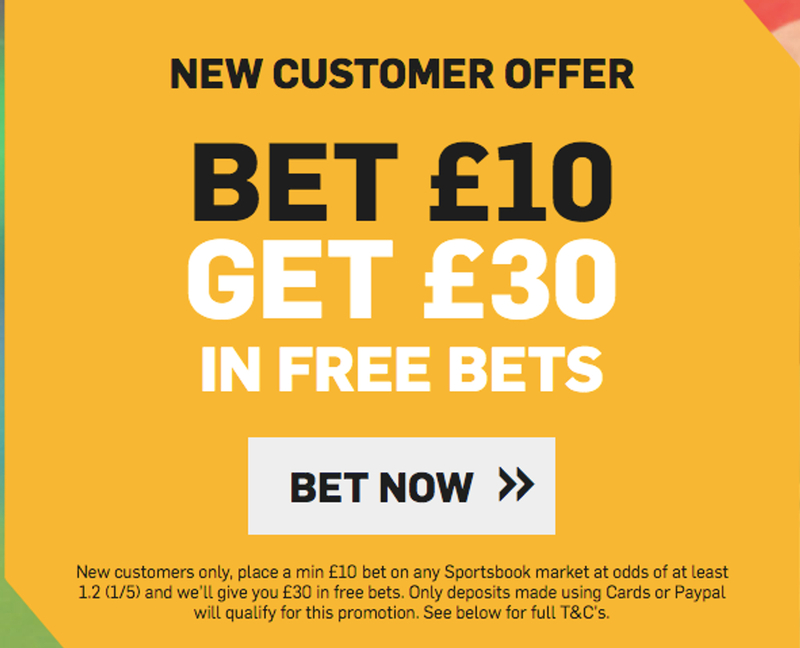 As a new customer you claim £30 in free bets to use on any market in their sportsbook - see how to claim below. 1. Open a new Betfair account by clicking HERE & use the promo code zsk200. Place a Sportsbook bet (minimum stake £10) at odds of at least 1.2 (1/5) within 30 days of opening your account. 2. Once your qualifying bet has settled you’ll receive £30 in free bets which will be valid for 30 days and redeemable against any bet on the sportsbook at odds of at least 1.2 (1/5) along with £10 to use on the Betfair Exchange. Key Terms: New customers only, place a min €/£10 bet on any Sportsbook market at odds of at least 1.2 (1/5) and we’ll give you €/£30 in free bets. Only deposits made using Cards or Paypal will qualify for this promotion. See below for full T&C's. Sign-up offers are a speciality for Betfair, who always look for new and interesting ways to get more customers placing their bets through them. The traditional bet and get option is always readily available with them but they also offer a variety of other methods to claim some free bets as you join, making them an exciting bookie to get involved with. Whether it’s the World Cup, the Champions League, the Premier League, or even a domestic cup fixture, Betfair will offer potential new customers with exclusive ways to join them. These will tend to consist of a team to win their upcoming fixture at enhanced odds, with prices even going as high as 70/1, and customers rewarded with £71 in free bets if the team wins their game as expected. If there’s an especially busy schedule, they will provide a similar offer but for four teams to win their games, usually reaching odds as high as 100/1, so it’s worth keeping an eye on this page for future Betfair new customer offers. Step 2. Apply Acca Edge to your chosen bets, this will update the odds of your bet. Step 4. Get your stake refunded in CASH if one leg lets you down. 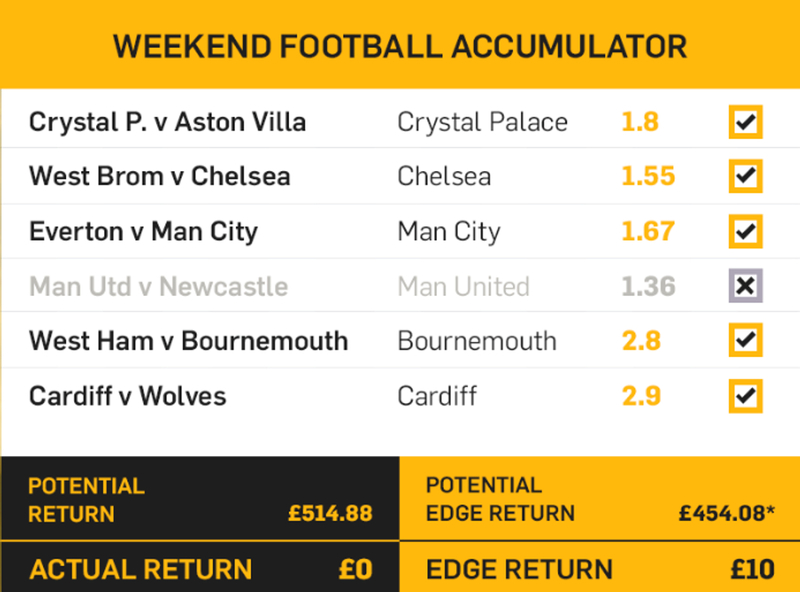 Alongside their other promotions Betfair also offer best odds on the Premier League, ensuring that you’re always getting massive value for money when placing your selections on the top flight. Betfair’s Sportsbook has offered the lowest overrounds on average on Premier League pre-match odds markets since 01/01/17, making them the industry leaders when it comes to the top flight. Being able to create your own bet from scratch on your own terms has been something punters have become more interested in doing, and bookmakers have been quick to facilitate that. Betfair’s version of this is #OddsOnThat, where all you need to do is tweet to Betfair using that hashtag and you can request a specific market made up of any and all selections you might want. Betfair will then swiftly price up your desired bet with generous odds. They also fill out their site with some Odds On That markets that they’ve already created, so all of the big games are covered extensively. Every frequent punter loves the chance to back their bets but at stronger odds, so it’s not a big shock for enhanced offers to be made available by all the major bookmakers. Betfair fulfil their duties through daily OddsBoosts, which are posted out frequently with enhanced prices on a combination of goalscorers or teams to win all put into one far larger selection. These are arranged in one tab for each day of the week, as well as special sections which become available when it’s the Champions League, FA Cup or any other key event.